Ask any group of knitters about swatching and you’ll probably hear a collective groan. Swatching (the process of knitting a sample of knitting to check gauge, to familiarize yourself with the pattern, to make sure your yarn of choice works for your pattern of choice, etc.) is the bane of many knitters’ existence. However, it is a useful little tool, really; it’s especially useful if you want to knit a garment that will actually fit the intended wearer. It’s also a very good way of familiarizing yourself with, or learning, new patterns or working with an unfamiliar yarn. 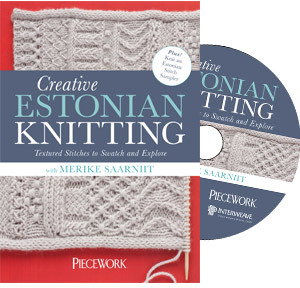 When I received an email from Interweave Knits this week, advertising “Creative Estonian Knitting” by Merike Saarniit, I was intrigued. It isn’t a book; it’s a dvd/video download. And it isn’t for a garment of any kind; it’s a swatch made with a variety of Estonian stitches. Merike, who is an American of Estonian descent, teaches a variety of Estonian decorative stitches and techniques. Ok, now I was more than intrigued. I bought it. I downloaded the video and have spent most of today playing with stitches. For the first time in a very long time, swatching has become fun! I’m very much enjoying her relaxed, easy to listen to explanations of the stitches. I can even see that some of the stitches she demonstrates could make a simple garment completely unique, without much difficulty. One advantage of having the video is that I can stop it and play with the stitch patterns at my leisure (it comes with a four page pdf of written instructions for each of the stitches). 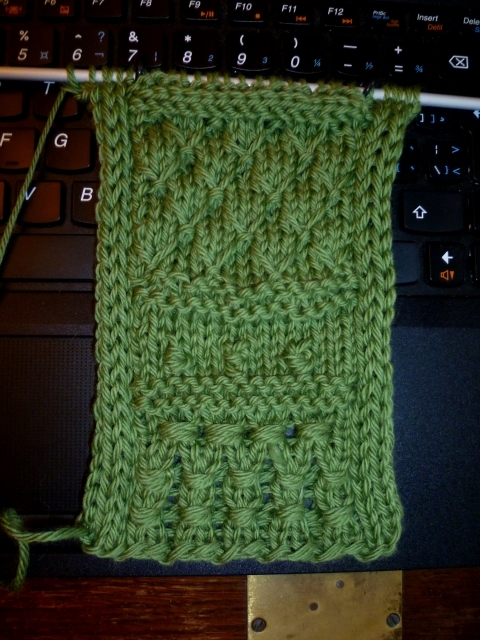 Here’s my swatch so far, with five of the stitches already done. 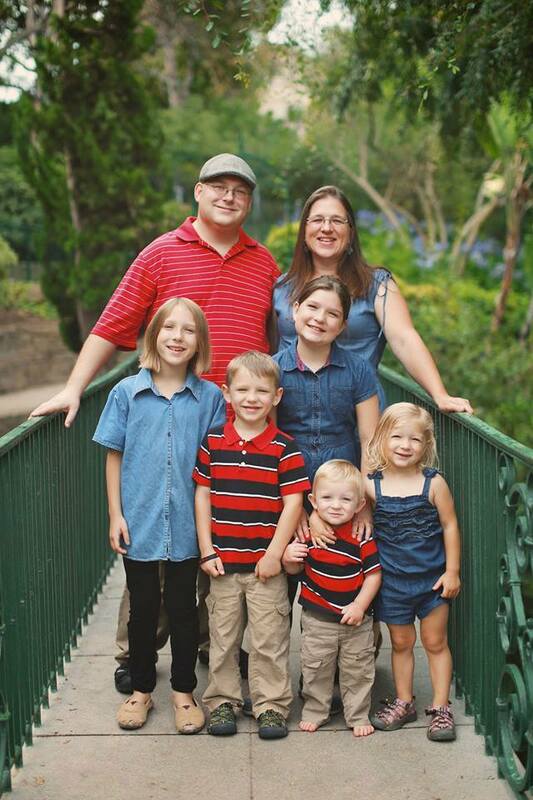 (In order, from the beginning to the needles: 1. Wrapped Nupp in Ribbing; 2. Wrapped Nupp over 3 stitches; 3. Knot Nupps; 4. Quilted Embrace; and 5. Horizontal Braid separator. 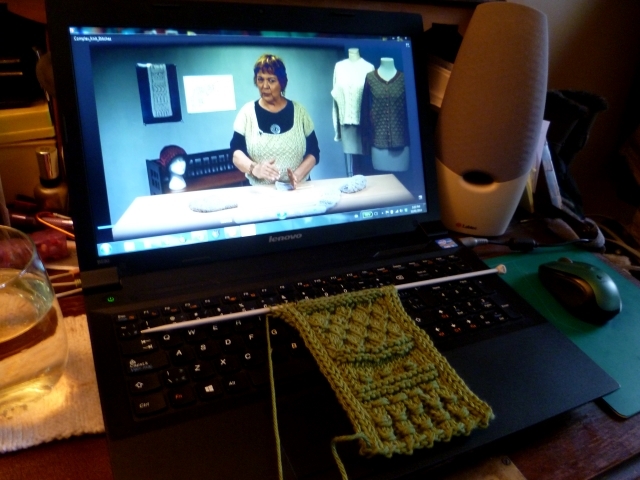 If you’re at all interested in learning about knitting from other cultures (as I certainly am), I can heartily recommend Merike’s video. Her voice is easy to listen to; the stitches are explained very well and the demos are well filmed. The cost isn’t prohibitive ($24.99 for the DVD disk, $19.95 for the download) and I know that I’ll be referring to the video again and again. Yup, swatching CAN be fun!